I am an intern at the Flywheel Project at Black Lab Sports, a venture capital firm in Boulder that invests in, launches, and scales companies whose founders “live their purpose and who focus on pushing the limits of Human Performance.” This internship has given me many unique opportunities. For my first project, I worked in a small group with two interns to help an abstract painter, Will Day, in marketing his works. At first, I thought, “How am I going to sell a $40,000 painting?” We first met to strategize and determine the purpose and message of the blog. We focused our first entry on the tremendous emotion expressed through his artwork. We met often with Will and he found that our discussions helped him clarify that his works are greatly influenced not only by emotion, but also through his interaction with people, places, and objects. He realized the blog helped him crystallize and articulate his feelings. I have also worked with REVO, a physiotherapy and sports performance start-up that provides physical therapy, evaluation, and sports training to athletes. REVO interests me due to my involvement in and love for soccer and sports. The company’s clients includes a wide range of athletes – from a high school soccer player to a highly acclaimed professional. REVO was the brainchild of three founders who attended a biomechanics seminar in 2015 and realized that traditional sports performance facility they used didn’t cut it for them. They wanted to take their own athleticism to a higher level while promoting health. They collaborated to make their vision a reality and to transform sports rehabilitation and training. I am currently helping the REVO team with its social media presence. I am documenting work with clients and creating daily posts with photographs and key wording. I am creating a collection of action photos, videos, and How-To videos with captions that will be potential future posts for their website, Instagram, Facebook, and IGTV. I am currently collaborating on a project with BLS analyzing “abundance” trends. With identified future abundance trends in mind, I am researching and identifying possible opportunities and impacts on the BLS ecosystem. My work will help develop a short-term plan to better identify prospect companies based on abundance trends. As a Flywheel Project intern, I have listened to and spoken with entrepreneurs involved in all stages and types of startups, including those outside of the BLS portfolio. The founder of Liberty Puzzles led my group of nine interns on a tour of his start-up company that creates wooden jigsaw puzzles in my hometown, Boulder, CO. Liberty Puzzles has grown from an unprofitable company to one that is profitable and growing rapidly. There are also a variety of speakers that come into the Lab to present business ideas, to share information about their companies, and to lead the interns in a variety of workshops that have included accelerated mind training and sports performance company analysis. 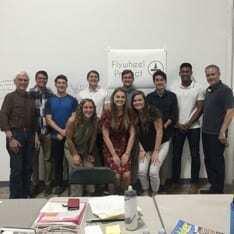 The Flywheel Project is proving to be a terrific internship opportunity. The experience has opened my eyes to incredible business opportunities. I have made lifetime connections with other interns and entrepreneurs. There is an overall rule at the Lab that each of us is here to help others, and others are here to help each one of us. I see that this rule is lived every day by each member of the ecosystem.